Gorgeous artist designed Greeting Card as a Gift Boxed Set, with a floating charm locket, complete with charms, custom engraved plate and gemstones. Included Charms: Moon and Star, Pink Crystal Heart and color gemstones. Complete gift set in a beautiful gift box, ready for your inscription. The cards are blank on the inside for your own special thoughts. Our custom designed greeting cards, designed by our own in house artist, is the special, unique touch to a gift for your Special Friend, Wife, Girlfriend, Daughter, Mother, Mom, Mommy, Grandma, Nana, Grandmother, Granny and Abuella will treasure forever. 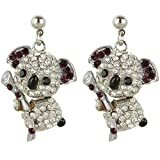 The highest quality floating charm lockets, made out of stainless steel, glass and crystals. Each pendant necklace comes with a 22 inch solid rolo chain with a 2 inch extender. Every locket comes with a custom engraved stainless steel plate, along with gorgeous charms and crystals, but most especially the A Touch of Dazzle guarantee, we stand behind everything we sell. Floating Charm lockets are a treasure chest of memories and favorite ideas. Collect them and treasure them, share them and display them. Perfect for gifts for birthday, anniversary, holidays, stocking stuffers, graduation, Christmas, Valentine's Day, Mother's Day, Thank You or simply "Thinking of You". I LOVE YOU TO THE MOON AND BACK!! Tell your special someone how much you love and appreciate them! This gift boxed set comes with our beautiful card designed by our own in house artist with a spectacular stainless steel floating charm locket COMPLETE with Charms, Crystals and Custom Engraved Plate. The greeting card, so beautiful and colorful on the outside, is blank on the inside waiting for your inscription and special thoughts. Your loved one will be truly touched by this original gift that is absolutely unique to A Touch of Dazzle.Perfect for Any OccasionOne of the best unique gift ideas for the lady in your life. When they open it, they will think "WOW! What a stunning floating locket charm necklace!" It's not your typical cheap fashion jewelry. This glass, crystal and stainless steel magnetic pendant locket necklace comes filled with the highest quality charms and crystal - PLUS our lockets always include the highest quality stainless steel chain! Our chains will not rust or tarnish, and are strong enough to last and carry your floating locket charm necklace for always. BUT, that is not all! You get a CUSTOM ENGRAVED BACKING PLATE. Yes, you guessed right, you will not be seeing our unique engraved plates anywhere but from A Touch of Dazzle. Show your special taste by wearing the one and only A Touch of Dazzle Engraved Plates. Perfect Gift for the Jewelry Lover Enjoy giving the best for birthday, anniversary, holidays, stocking stuffers, graduation, Christmas, Valentine's Day, Mother's Day, Thank You or simply "Thinking of You" wedding, anniversary, 21 year old birthday party, housewarming, Christmas present, stocking stuffer, Valentines, Bridal Shower, Mothersday, Step Mom Necklace, Mother daughter exchange, even gifts for mother in law! Discounted Handmade Greeting Card Box Set Floating Locket Pendant Necklace with Charms I Love You to the Moon and Back is everything I could dream of. The store is great, btw! Thank you very much! i got the Handmade Greeting Card Box Set Floating Locket Pendant Necklace with Charms I Love You to the Moon and Back today and i’m satisfied! 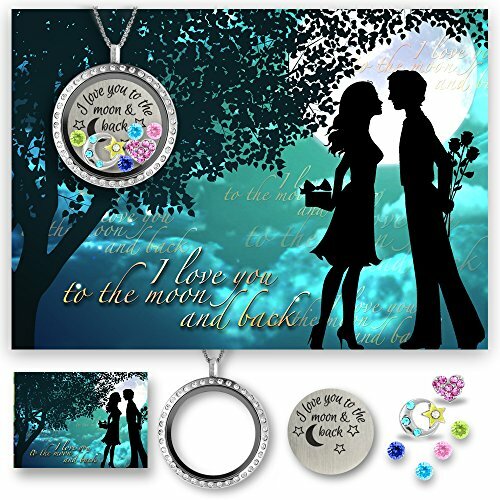 Such a low priced Handmade Greeting Card Box Set Floating Locket Pendant Necklace with Charms I Love You to the Moon and Back is truly a bargain. Thanks to the seller! Bought a brand new Handmade Greeting Card Box Set Floating Locket Pendant Necklace with Charms I Love You to the Moon and Back from this shop. Awesome! probably the cheapest Handmade Greeting Card Box Set Floating Locket Pendant Necklace with Charms I Love You to the Moon and Back online. glad i found the store! Where can i buy Handmade Greeting Card Box Set Floating Locket Pendant Necklace with Charms I Love You to the Moon and Back for such a good price, if not here? Nowhere!